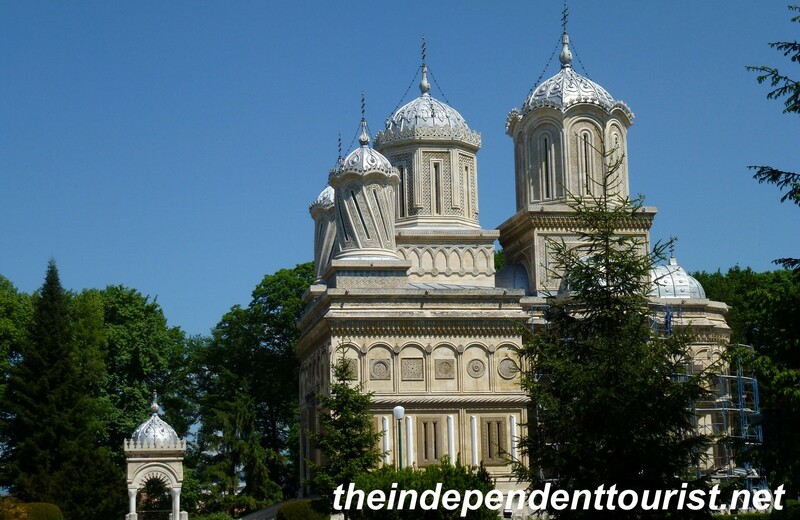 Just about 2 ½ hours by car (155 km) from Bucharest are two very interesting churches, located in the town of Curtea de Argeş. Curtea de Argeş is the gateway to Poienari Castle (about 25 km north) and the Făgăraş Mountains (the Transylvanian Alps). One church, called the St. Nicholas Princely Court Church is the “oldest monument preserved in its original form in Wallachia” (this region of Romania) and the other is the Curtea de Argeş Monastery, a small “Taj – Mahal” like church (ok, not quite the Taj Mahal, but its exterior is still an example of amazing marble work) where the kings of modern Romania are buried. 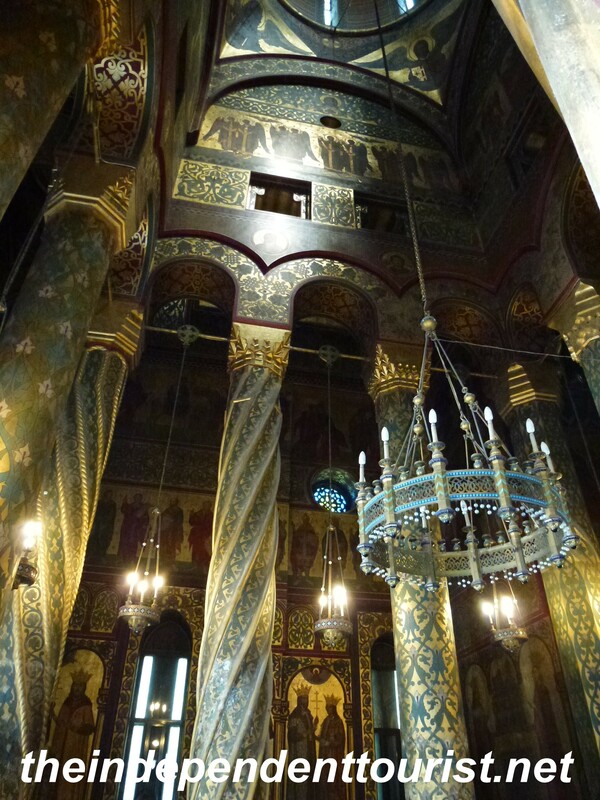 The beautiful marble exterior of the Curtea de Arges Monastery. Exterior view of St. Nicholas Princely Church. 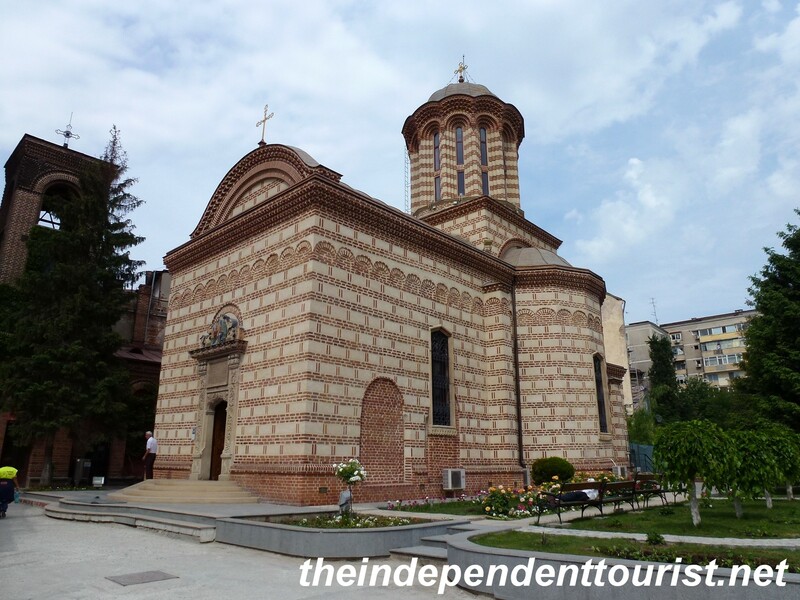 Curtea de Argeş was the seat of Romanian princes of Wallachia, and hence the name of this church. 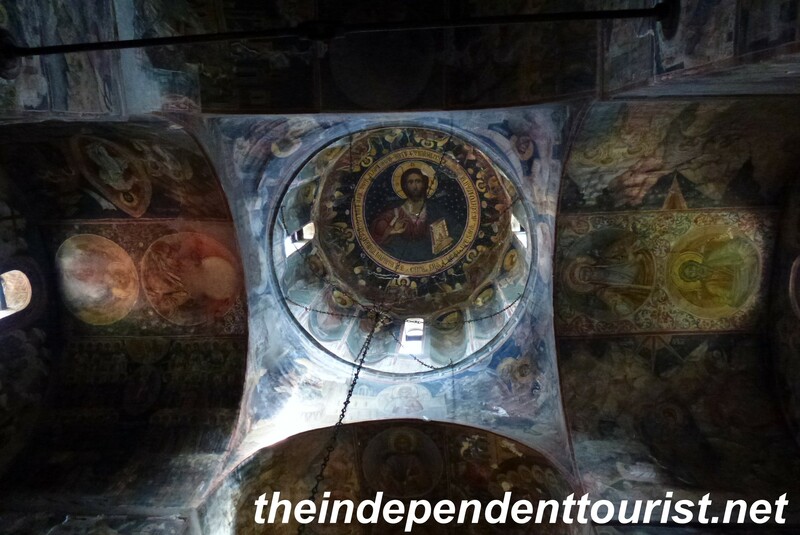 If you are a student of Byzantine religious history and artwork, St. Nicholas Princely Church is on your must-do list, it is one of the most important ecclesiastical buildings of its time. 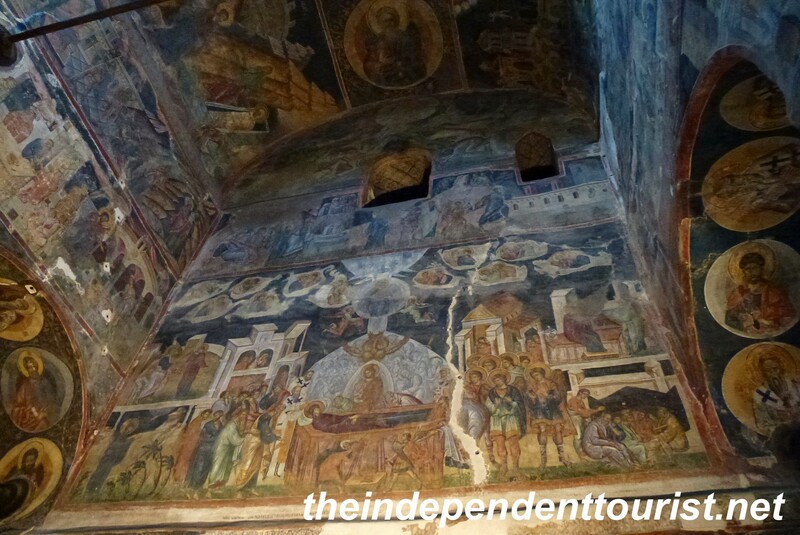 Completed in the 14th century (1340-1352), it has intact Byzantine frescoes from 1364-1369. A very nice gentleman gave us an impromptu tour—the church had just closed and he reopened it for us, he was a wealth of knowledge. 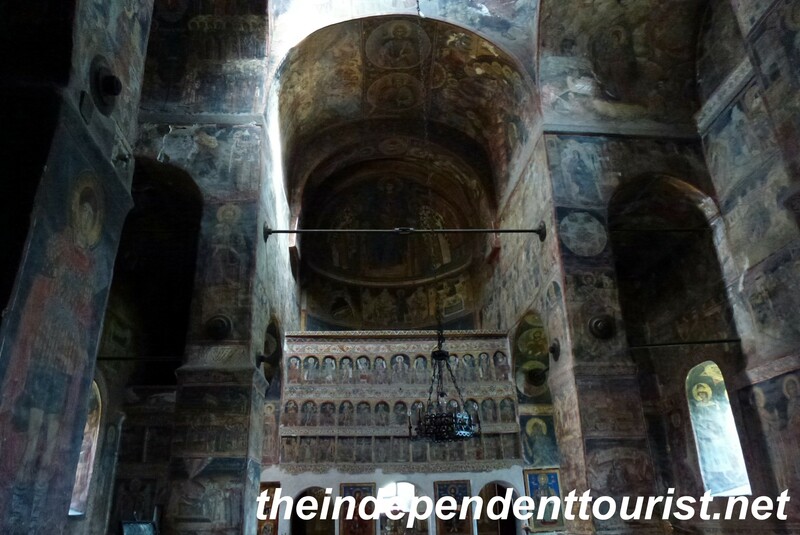 The style of frescoes in this church is a mix of Italian and Byzantine influences, and many important priceless artifacts were found in the 14 tombs (buried on the church grounds) of the local ruling class, which are now in museums in Bucharest. The church is in the shape of Greek cross. There was a fee of 6 lei per person (about $2 USD). 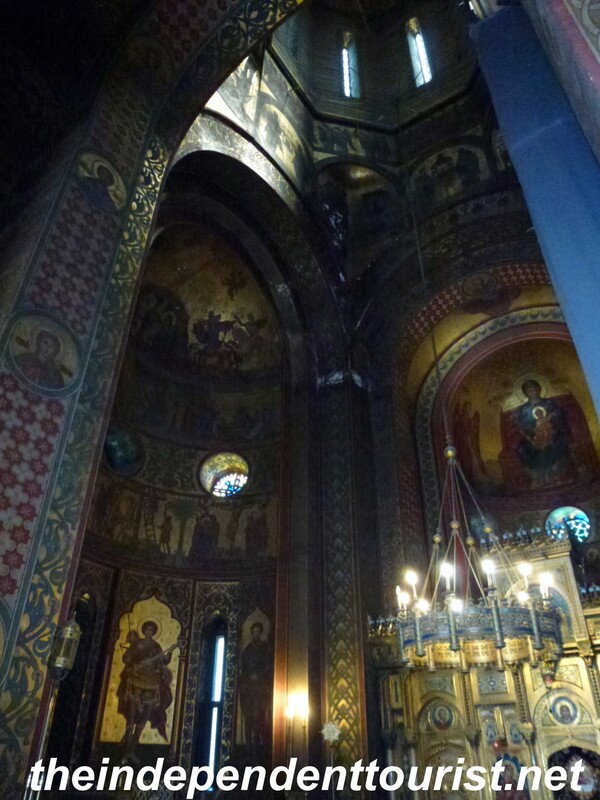 A view of the highly decorated interior of St. Nicholas Church. The frescoed wall above the church entrance. It may be hard to tell, but this is looking straight up at the cupola of the church. This monastery was originally built 1512 – 1521, with marble from Constantinople (Istanbul). Legend has it that the master stonemason’s wife is buried within the walls; it was a local custom that the mason had to bury a loved one alive in the church to ensure the success of his work, since ghosts were believed to keep buildings from collapsing. If you built many structures, you might run out of loved ones to bury—what a sad tale. The monastery had to be largely rebuilt in 1875, after years of neglect. A view of the exterior of the Curtea de Arges Monastery. An interior view of the monastery. Another view of the interior of the monastery. 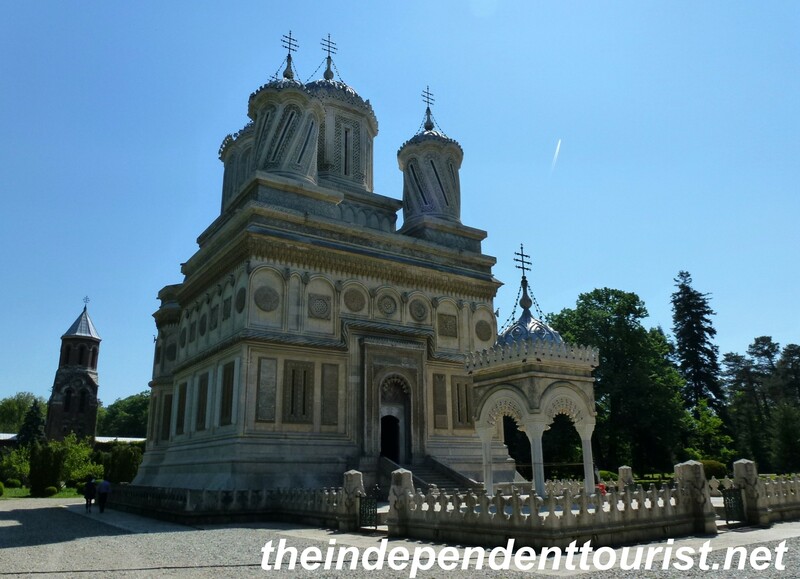 The church contains royal tombs–two kings and queens tombs lie here, King Carol (the first king of Romania) and his wife Elizabeth (the builders of the incredible Peleş Castle), and King Ferdinand and Queen Marie (granddaughter of Queen Victoria of England). It was difficult to get photos in this church due to restrictions. The monastery is free. References: Lonely Planet Romania Guide, 2010; Rough Guide Romania, 2008. 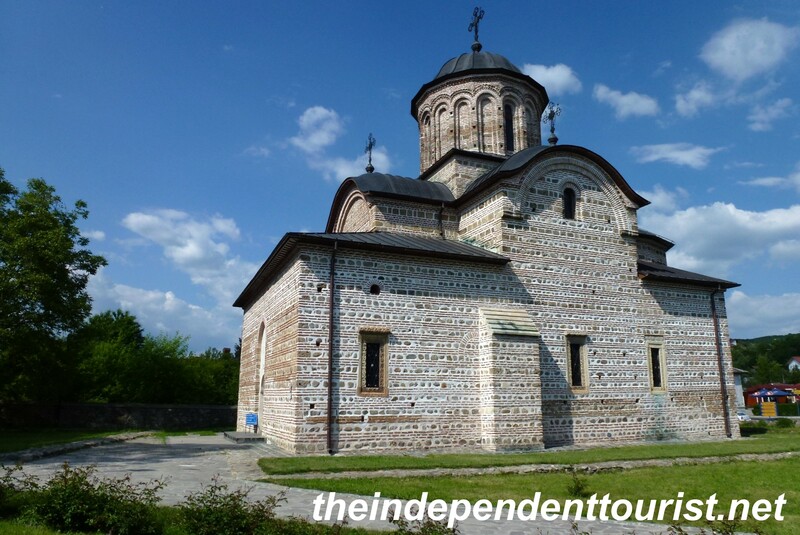 Posted in Romania and tagged Byzantine Churches, Curtea de Arges, Romania Travel on April 22, 2013 by Paul Terry. At the end of our wonderful trip to Romania, we spent a couple days exploring Bucharest. 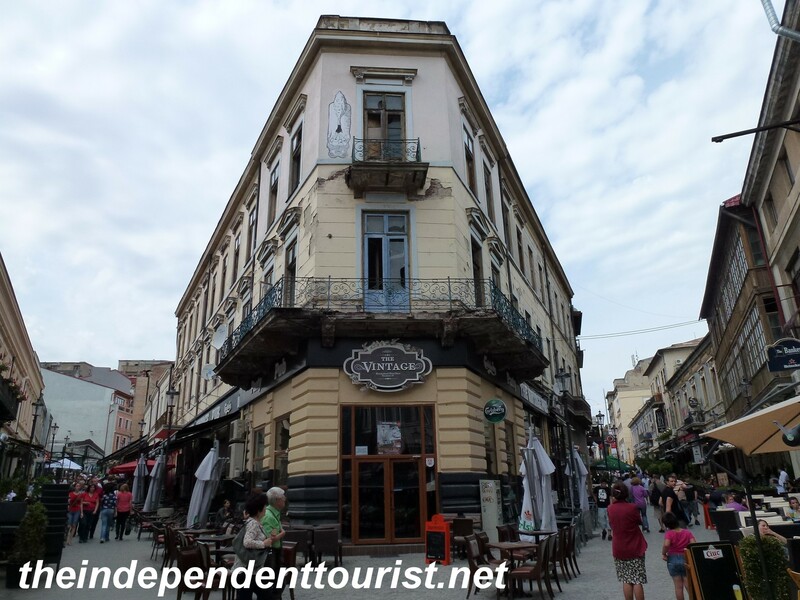 We stayed in an apartment on the south side of the city, within walking distance to one of the main squares (Piata Unirii) where the tourist “hop on, hop off” buses depart (25 lei per person for the round trip), and close to several sights. The Bucharest airport is on the north side of the city, about 30 minutes from downtown. 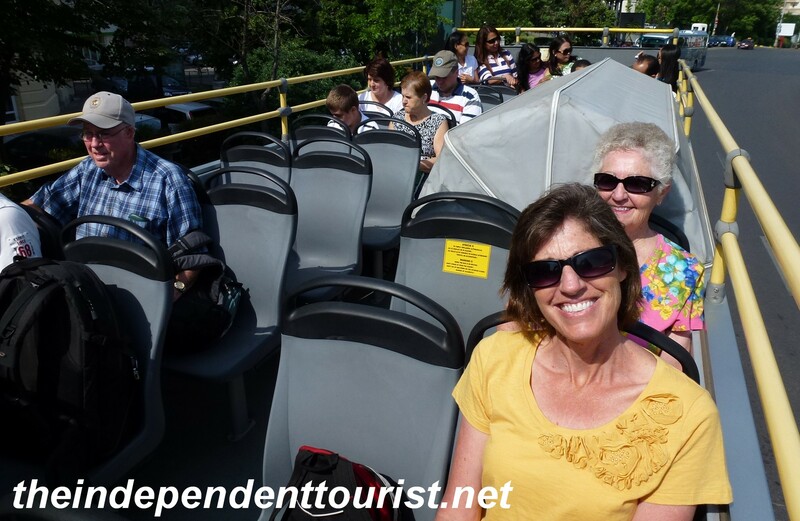 On the open-air hop on, hop off bus tour of Bucharest. Paris? 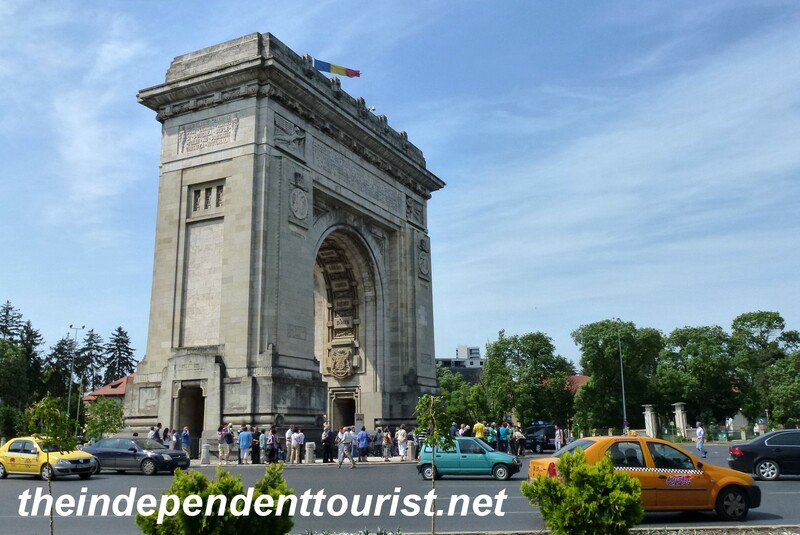 No, but almost – Bucharest’s Triumphal Arch. Built in 1935 to commemorate the reunification of Romania in 1918. For a fee, you can climb to the top. The Romanians love the late Michael Jackson, even though when here on tour he said “Hello Budapest, I’m so glad to be here.” Oops. Having been to many European capitals I will admit that Bucharest doesn’t make my top 10; however, it still has a number of interesting sights, the two primary ones being the Parliament Palace and the Village Museum. I will cover the Village Museum in a separate post. The front view of the Palace of Parliament. “Huge” is an understatement. 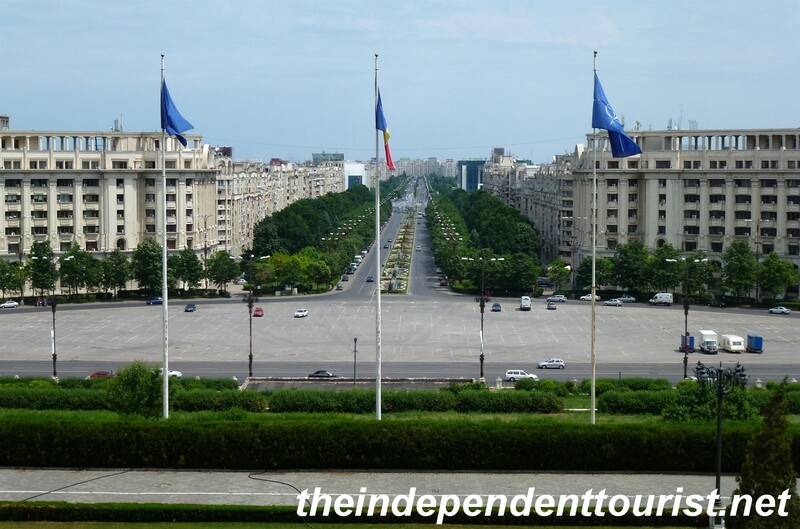 The Palace of the Parliament is the 2nd largest building in the world after the Pentagon, and was built in 1984 in the latter days of the Communist Regime under the dictator Ceauşescu. On our tour we saw less than 2% of the building. It is 12 stories high, has 1,100 rooms and four underground levels including a nuclear bunker. About 20,000 workers labored around the clock to build it in 5 years. One of the hallways in the Palace. One massive staircase had to be rebuilt 3 times before Ceauşescu was satisfied. The saddest part is that for the cost of this immense building much could have been done to help the very poor average Romanian at the time. 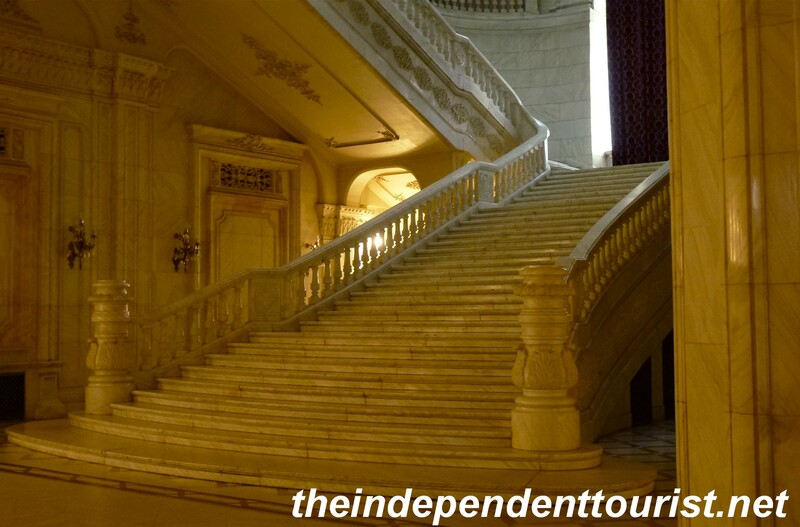 A grand staircase in the Palace. 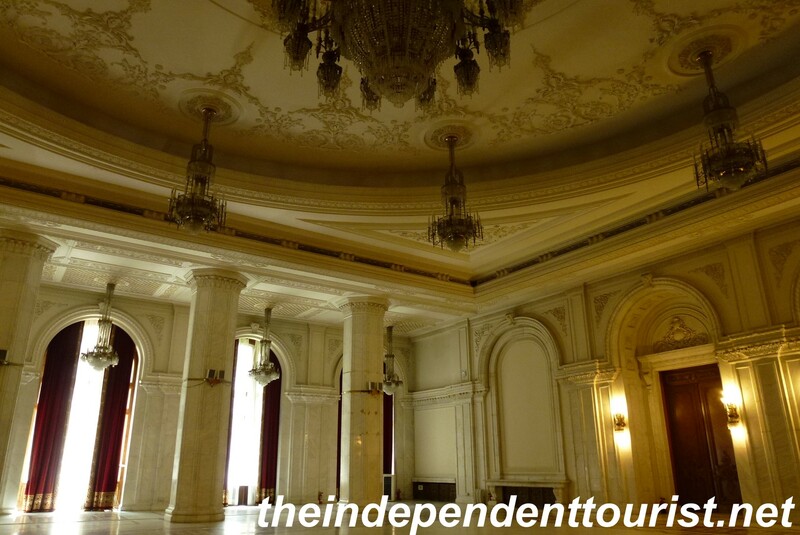 One of the Palace’s reception rooms in which foreign dignitaries were met. 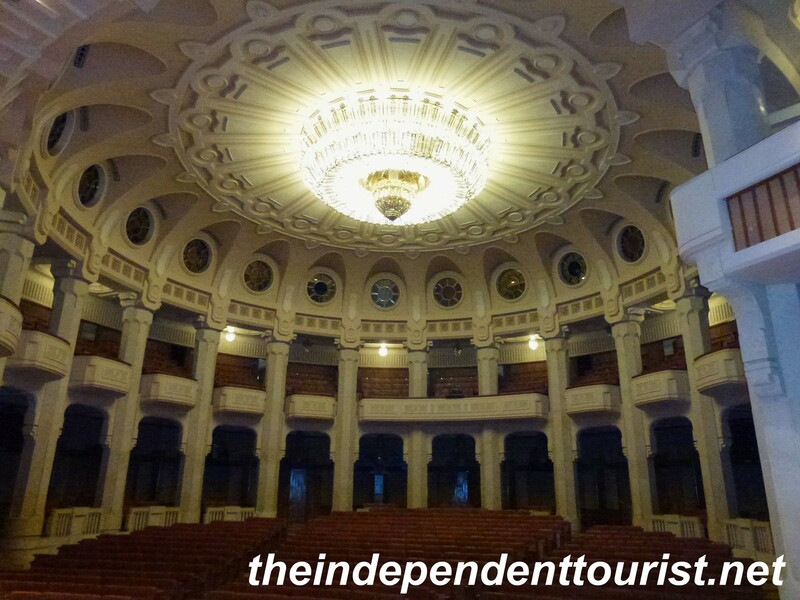 The 2.5 ton chandelier in the Human Rights Hall of the Palace. 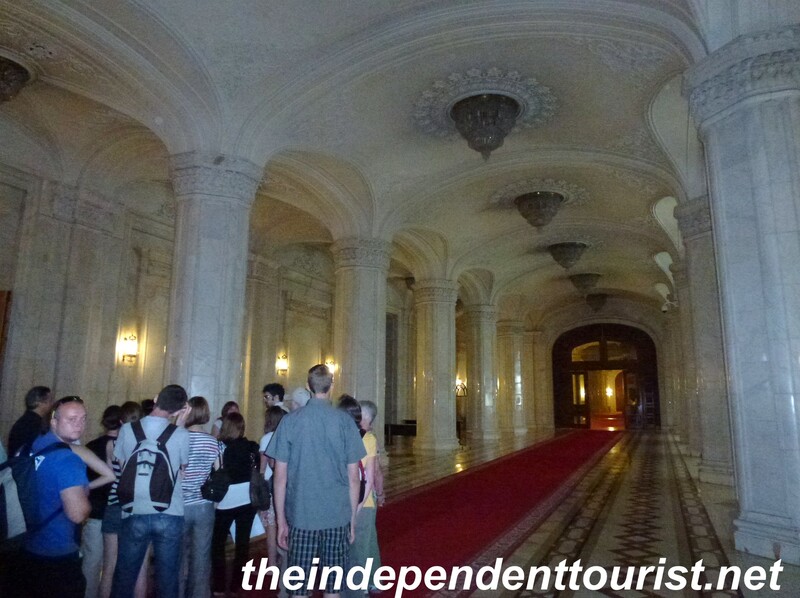 Tips on visiting the Palace: Tours are conducted regularly and advance reservations are generally required. We lucked in to an English-speaking tour without reservations by arriving about 45 minutes early in the off season (May). Since this is still a functioning government building, they are very strict in regards to picture taking—security cameras are everywhere, and wandering off from the tour group is not allowed. Not wanting to spend time in a Romanian prison, I paid attention to our tour guide’s requirements. The cost was 25 lei per person plus 30 lei for a photography pass (about 3 lei per USD). Looking east from the famous balcony of the Palace, towards the Piata Constitutiei. Another interesting area undergoing refurbishment is the city’s old quarter, not far from the Palace. There are many restaurants here, and a few historical sites such as the Princely Old Court Church, and some 15th century ruins. 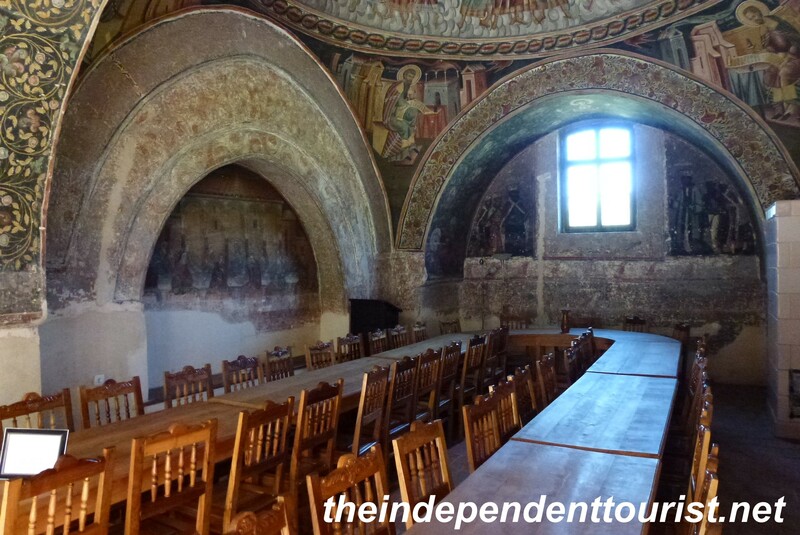 Princely Old Court Church – the oldest church in Bucharest (1500’s). There are excellent frescoes in this church. The old quarter of Bucharest. 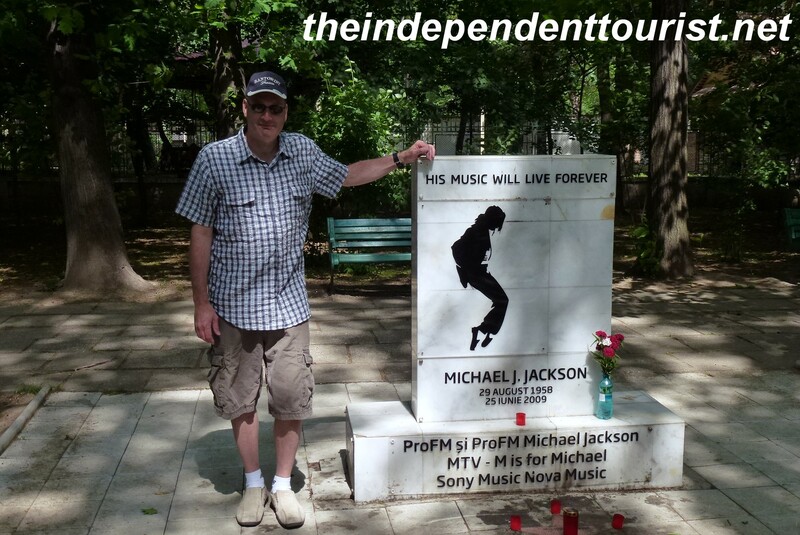 Posted in Romania and tagged Bucharest, Romania Travel, Things to see in Bucharest on January 11, 2013 by Paul Terry. The main entrance to Corvin Castle. One of the best castles in Romania is Corvin, a 14th century castle located in the city of Hunedoara, at the western edge of Transylvania. This castle receives few visitors since it is a bit off the beaten path in Transylvania and since Romania in general is off the beaten path. We drove to Hunedoara from Sibiu, which took about 2 hours. The castle is at the western edge of the city, on a slight hill. The city of Hunedoara has a communist-era feel owing to several old (closed) steel mills located here due to the iron ore in the nearby hills. The iron deposits were even known by the Romans. For a map of locations visited in Romania click here. The Council Hall of Corvin Castle. The chapel at Corvin Castle. The eerie unrestored part of Corvin Castle–Dracula would be right at home! The castle and the town get their names from two kings (Ioan Huneadoara and his son, Matthias Corvinus), considered among the greatest Hungarian rulers of Transylvania. A statue of Ioan of Hunedoara, the Hungarian King responsible for the rebuilding of Corvin Castle in 1453, the town where the castle is located bears his name. In the 14th century, Turkish prisoners had the fun job of hewing the castle walls out of solid rock. Also, in the 15thcentury, three “lucky” Turkish prisoners had to dig a well, and were promised their freedom by King Ioan after its completion. It took them 15 years to dig about 100 feet deep, when they finally found water. Ioan was dead by the time they finished, and his wife, Elisabeth, revoked the king’s promised and had the three prisoners put to death. Upon learning their fate, one of them wrote on a stone in the well: “You may have water but you have no soul.” I wonder if those words haunted Elisabeth. The inner courtyard of Corvin Castle. The Mace Tower, Corvin Castle. Note the traces of 15th century frescoes on the outside. The Knights Hall at Corvin Castle. One more view of Corvin…a classic castle, with a long drawbridge over the huge moat. Jules Verne thought enough of this castle to include it in his book, Around the Word in 80 Days, in 1873. It is one of the great medieval castles in Europe. The entrance fee was 10 lei (3.3 lei to the US dollar) and a photo pass was 5 lei. We noticed these very unique metal roofs all over Hundedoara. Hungarian influence? References: Informational signs throughout Corvin Castle. A view of Sighişoara and surrounding countryside. Sighişoara is the best-preserved medieval city in Transylvania. Vlad “The Impaler” Ţepeş (“Dracula”) was born here in 1431, his father being “Vlad Dracul,” a member of the “Order of the Dragon.” For a map of locations we visited in Romania, click here. The plaque on Vlad Dracul’s home, the birthplace of Vlad “The Impaler” Ţepeş. Vlad “The Impaler” Ţepeş birthplace, the yellow house on the left. The origins of the town date back to Roman times, and German Saxons moved here during the 12th century, being promised autonomy in return for defending Transylvania from the Ottomans. About 500 Germans still live here. The towers (9 of them remain) and walls surrounding the old town are from the 14th and 15thcenturies. You can walk around the old town in less than an hour, although there are some interesting museums and churches to visit also. We enjoyed exploring the old narrow lanes and towers. This town has the perfect look for a “Dracula” movie. The main entrance to the old citadel of Sighişoara, under the Clock Tower built in the 14th century. In medieval times, Sighişoara was in a good location for defensive purposes, situated on a hill surrounded the Târnava Mare river, and between the cities of Braşov and Sibiu. When the town came under siege, the alarm was given by a big bell. Everyone had a specific duty to contribute to the protection of the town, based on their training over the years. The craftsmen would fight from the fortress walls and towers, the women and children would prepare hot water and pitch which they would throw upon the heads of the attackers, the old men would give advice and the old women would take care of the wounded. Each guild had a tower that it built and defended. The Tinsmith’s Tower and defensive walls of Sighişoara. Practicalities. We stayed in a small pension just outside the old citadel, called Pensiune Citadela Sighişoara, which can be found on booking.com. The Pensiune Citadela Sighişoara is on the right, with our car parked in front. This pension was in an excellent location and had decent rooms with exposed old wooden beams, which gave our accomodation a medieval feel. There is a tourist information office just across the street from Vlad Ţepeş’ home (now a restaurant). We ate a very good dinner at the “Stag House” or Casa cu Cerb, just a hundred feet from Vlad Ţepeş’s home, which is also a hotel. Prince Charles of the United Kingdom stayed here in 2002. The Casa cu Cerb (hotel and restaurant) is the white building on the right. The Piaţa Cetăţii is the geographical center of the town, and is the citadel’s main thoroughfare. The first homes were built around this square. Piaţa Cetăţii, the main old town square. Posted in Romania and tagged Birthplace of Dracula, Romania Travel, Sighisoara, Transylvania, Transylvania Travel on July 16, 2012 by Paul Terry. In need of marriage counseling? Visit Biertan! The grandest of the fortified churches in Transylvania – a UNESCO World Heritage Site. If your marriage or partnership is suffering, visit Biertan fortified church in Transylvania. There is a room here where couples would be banished for two weeks in medieval times to work out their differences. The room contained only one small bed and one set of cutlery. In 400 years, only one couple went through with divorce—not a bad rate of success! The Lonely Planet Romania Travel Guide advises you to save this fortified church for last, if you are visiting several. We followed their advice, and I understand why now. Biertan is a picture-perfect fortified church in the village of Biertan, sitting on a small hill, surrounded by higher hills. Having taken a little detour from Sighişoara (Biertan is 27 km southwest of Sighisoara), we arrived from the south, and followed a dirt road into the village. For a map of our route in Romania click here. The inside of Biertan church – the altarpiece paintings are from 1483-1515. The frescoes inside one of the towers surrounding the church. The church was built in the 15th century and is surrounded by walls and towers and has an old covered stairway climbing from the main square of the village up to the church. Gravestones of the Lutheran bishops who served here from 1572 to 1867 are located in this tower. One of the towers surrounding the church. A view of the church from Biertan village square. The sacristy door lock – 19 locks in one! A marvel of engineering that won first prize at the Paris World Expo in 1900. The church’s treasures were behind this door. Leaving Biertan to the north, the road is paved to the main highway (Highway 14) connecting Sighişoara to Sibiu. A view of Biertan village from the church, looking south. If you only have time to visit one fortified church in Transylvania, this is the one. The entry fee is 8 lei per person (about 3.3 lei per US dollar). Posted in Romania and tagged Biertan Fortified Church, Fortified churches of Transylvania, Romania Travel on June 29, 2012 by Paul Terry. A great day trip from Braşov is visiting the fortified churches in Harman and Prejmer, towns that still retain their Saxon roots. We visited these churches as we left Braşov before heading to Sighişoara. The easiest way to visit these towns is by rental car, but it’s also possible by train or bus. Hărman is not open Monday and Prejmer is not open Sunday, so if you want to do both, you’ll need to visit Tuesday—Saturday. For a map of sites visited in Romania click here. Exterior view of Harman fortified church with the walls and towers. Fortified churches are a unique feature of Transylvania, and there are 280 in Transylvania. Each one has its own different style, but common features include high surrounding walls (sometimes several concentric rings) usually with towers, a church in the center of the fortifications, often with its own tower, and rooms for provisions in case of attack and sometimes boarding rooms for the villagers inside the walls—these fortifications often look like a combination of a castle and church. A whole trip could be spent just visiting these wonderful sights, and maps are available that show driving tours of these churches, which are often in little villages. The two listed here are close to Braşov and close together. Their purpose during medieval times was to provide safety to the villagers in times of attack, often from the Ottomans as they sought to expand their empire westward. The church at Hărman dates back to 1240, the belfry tower was added in the 14thcentury, and the walls were constructed in the 15th century. Even the church had exterior rooms for protection–ladders could be pulled up. In addition to the church, the fortifications retain part of the interior living and storage rooms along the walls, giving a feel to what the internal fortifications looked like. The storage and living quarters along the inside walls. You can visit some of the rooms and dark walkway around the wall which haven’t changed much from their original state. In the church, women would sit in the center pews and the men on the side pews, in case of attack the women would be in the center protected by the men surrounding them. The pews where the women would sit in the church. The men would sit in these side pews to protect the women. It would have been quite a life to constantly worry about your village being attacked by the Ottomans. The walls originally had a moat around them, and part of it is still visible. The caretakers of this church are German, descendants of the Saxons who settled this town. The entry fee was 4 lei per person (about $3.25). The village of Prejmer is more rustic than Hărman, with dirt roads in some parts of the village. A typical street scene in Prejmer–note the horse-drawn “tractor” on the right. The fortified church has very high walls (12-14 meters high), and given its size, it’s difficult to appreciate from the outside. Exterior view of Prejmer fortified church. Reinforced door at the entrance to Prejmer fortified church. Prejmer was the most powerful peasant fortress in Transylvania. The main entrance feels like a step back in time, just like walking into a medieval village. This fortification also had a moat, which has since been filled in. The entrance to Prejmer fortifications. Beyond the initial entrance, there is another entrance into the interior courtyard where the church is located and surrounded by little rooms (272 of them) on four levels attached to the defensive circular walls. The 13th century Prejmer church. The interior shelters of Prejmer–where the villagers would live in times of pending attack. These rooms are well-preserved, and from the courtyard the ring of rooms almost looks like a hotel, with numbers on each door. Each room was assigned to a village family. Many of the rooms are open, and they also provide access to a dark walkway running the length of the walls at the top, where guards and lookouts could be posted. Typical living quarters inside the fortifications. The walkway on the upper floor around the walls of Prejmer fortifications. Some rooms were also dedicated to specific purposes–such as a school, for storage, weaving, etc. The entry fee was 8 lei per person. A school room at Prejmer. Note the wall paintings. As with many sites we visited in Romania, we pretty much had these places to ourselves. 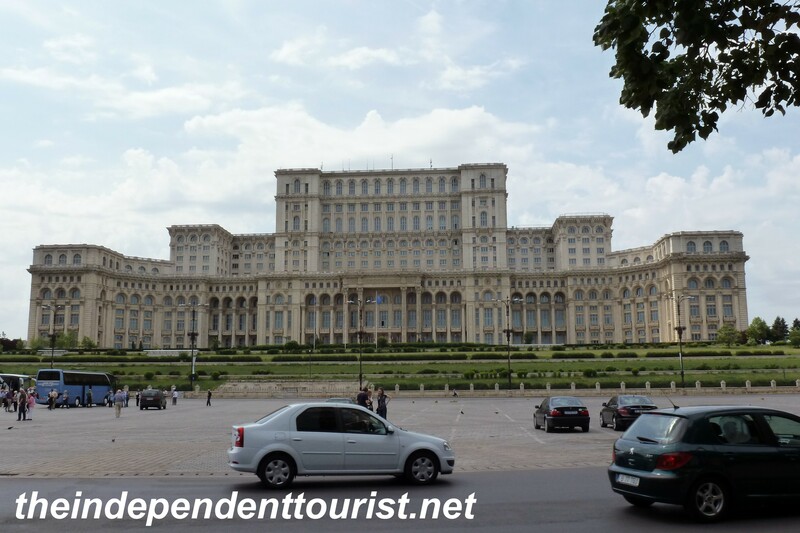 References: Lonely Planet – Romania & Information at the sites.